What are the advantages of citizen participation in scientific projects? Where are the limitations? And why is it that not all scientists are enthusiastic about this trend? Advocates as well as pundits come together for a discussion in Berlin concerning “Citizen Science”. Podium discussion: Christiane Grefe, Editor, Die Zeit; Josef Settele, agricultural biologist and ecologist at the Helmholtz Centre for Environmental Research - UFZ; Günter Stock, President of the Berlin-Brandenburg Academy of Sciences and Humanities; Johannes Vogel, Director-General of the Museum für Naturkunde. Citizen Science is in vogue like never before. Citizen scientists count endangered plants and animals, process regional history and measure light pollution via smart phone. What are the advantages of citizen participation in scientific projects, and why is it that not all scientists are enthusiastic about this trend? Johannes Vogel is absolutely convinced that citizen participation is contributing to a new form of understanding in science. The Director-General of the Museum für Naturkunde in Berlin is recognised as one of the most engaged advocates of Citizen Science in Germany. At the very start of the event he illustrated, in a motivational speech, the opportunities available to this movement on the basis of a huge error from botanical history. In Great Britain the English bluebell is considered to be a kind of floral national treasure, which is however in competition with the introduced Spanish bluebell. Nobody knew which of the two plants was more prevalent. For this reason, thousands of citizens were contacted a few years ago to help determine, on the basis of clear and expert-defined characteristics, whether sighted bluebells were English (Hyacinthoides non-scripta), Spanish (H. hispanica), or a hybrid form of both. The results dumbfounded the scientists, because the diligent citizens ended up finding the hybrid variety almost exclusively in Britain. This was an outcome that simply could not be. The mistake however did not originate with the laymen; rather, it came from the botanists who had many years previously specified erroneous characteristics for the identification of bluebells. The participants in the discussion podium were subsequently in agreement – Citizen Science offers a previously non-existent opportunity to sensitise the public to scientific topics. 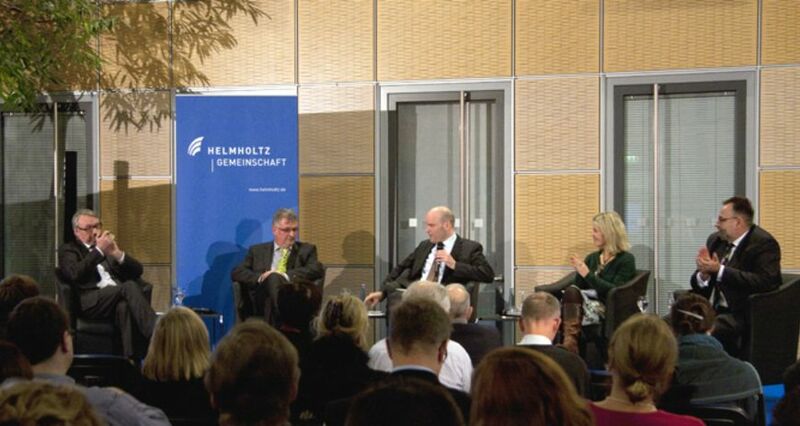 Vogel emphasized that it is the task of each individual scientist to enter into dialogue with society: “The obligation here is borne by the scientific sector.” A concrete example of what this dialogue can look like was provided by Josef Settele from the Helmholtz Centre for Environmental Research – UFZ. The agricultural biologist and ecologist has founded, in the form of butterfly monitoring, his own Citizen Science project. There are many individuals who observe butterflies, but they usually do this according to their own rules and techniques. The introduction of butterfly monitoring, says Settele, is an attempt to guide the citizens in their research. His project shows that citizen participation is particularly appropriate for the natural sciences. In order for Citizen Science to function properly, emphasises Settele, one has to be ready to leave institutional research requirements behind in order to be open to new approaches. As long as the issue is pure observation of nature, Günter Stock, President of the Berlin-Brandenburg Academy of Sciences, confirms on this evening that he is also in favour of the emergence of Citizen Science. At the same time however, he expresses a warning regarding the dangerous side of citizen participation; there is a threshold that is exceeded when, at the latest, laymen conduct experiments on their own in high-risk disciplines. “Science is no longer a “hands-on” activity in many cases today”, he emphasises. “The complexity of research at the atomic and molecular level can only be comprehended by trained scientists.” Consequently, the discussion of the household kitchen being used as a gene laboratory for experimentation by eager citizens devolves, in the course of the evening, into a dystopia of Citizen Science. ZEIT-editor Christiane Grefe mitigated the gloomy mood with the reminder that citizen participation in science is nothing new; rather, it was also an aspect of the philosophical Enlightenment. She noted that in the 70s and 80s, citizens were quite critical in their attitude towards expert opinions regarding environmental issues, and that they hence got themselves involved in the background of the scientific stage. She was thus able to illustrate that Citizen Science is only one aspect of a much larger issue: How do we deal with citizen participation in general? This is a question that the whole spectrum of society has to work out separately. Science has to be transparent and maintain ethical criteria – no matter whether it concerns professional research scientists or interested laymen. In the end, all participants were able to agree with this thesis. As far as the initial example of the English bluebell is concerned, Günter Stock undertook one more attempt in the end to come to the defence of the guild of professional scholars: “Perhaps research scientists neglected this field, because it was simply not relevant enough in their eyes, and not because they wouldn’t have been able to do it any better”.